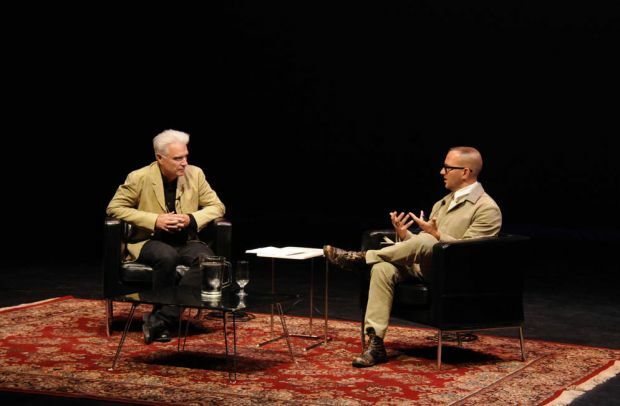 There were some high points to the staged discussion this week in Toronto between musician/much-else David Byrne and author/Internet activist Cory Doctorow, on the occasion of Byrne’s tour for his terrific-sounding book How Music Works. But they didn’t stop the feeling that this conversation shouldn’t have taken place in this form at all. For example, Byrne recounted a conversation with his 22-year-old daughter about copyright, in which he said that under current rules his work would go on supporting her financially long after he was ­dead, and that he thought this was kind of a bad thing, both for the art (which would not join the public domain as it should) and (he implied) for her own autonomy. Sorry, honey! For his part, Doctorow passionately made a case that the business model that evolved in the 20th century for musical cover versions – the original creators can’t prevent anyone from covering their songs as long as they’re paid a royalty – should in fact be a model for how all copyright, especially online, works. He elegantly argued that music as a human practice long predates the existence of commercial markets for it, and that the only sane way to develop systems of regulation is to make them true to the spirit of the historical norms that surround it, such as that anyone ought to be able to sing any song, in public, and that any reasonable definition of public in the 21st century includes, for example, YouTube. But there were assymetries in their conversational style that made for an uncomfortable evening, and not in a particularly enlightening way. Byrne is an artist whose social awkwardness (although much mellowed by age) is part of his essential makeup, as is his logical but lateral thinking, and his kind of savant-ish gift for deriving abstract proposition from experience via free-associative rumination. (It’s how he finds himself a city, picks a building that he wants to live in – it’s over there – water flowing underground, into the blue again.) And while he’s a very savvy user of technology for someone of his generation, I don’t think he has immensely much to tell us about the Internet that any intelligent person who’s been paying attention doesn’t also know. Doctorow, meanwhile, is a professional opinion-giver, a whip-smart advocate for strong positions on contemporary technology and society. Where Byrne conversates a bit like a chickadee lighting from twig to palm with a beakful of seed, Doctorow expounds like an eloquent atheist preacher at the digital pulpit. That’s no slight against Doctorow. The situation did him the greater disservice, making much of the audience turn against him, frustrated they weren’t hearing more from the better-known personality (at least in the demographic that is likely to attend a $25-ticketed literary conversation). No one was going to hold it against David Byrne. Much beyond the specific miscasting of these two as conversational partners for an audience (I’m sure as conversational partners on their own they’d have a great time), there are general lessons here. A while ago, I was very kindly brought out to Portland to do a presentation about my work to a university audience. Even more kindly, the organizers thought that since I’d come all that way, we should put on another public event in town. Who else should be on the bill? Portland has a lot of interesting personalities, and to my surprise after some casting about, Frank Black (aka Charles Thompson, aka Black Francis of the Pixies) agreed to participate. Come that night, even though the themes of our conversation were organized around my book, of course most people who came to the show were there to see Frank Black (in the Q&A they kept trying to get him to sing songs). I was the “Mwah-mwah-blah-blah-blah” on that bill. The only real option for the relatively obscure critic-author on stage with the famous musician was to fall into the role of his interviewer. Charles was extremely gracious and I really enjoyed the experience on many levels, but ultimately, as an event purportedly about my book, it didn’t make much sense. Let’s derive a few rules of thumb from these stories. (I’m indebted to post-show conversation partners, Misha Glouberman, Chris Frey, Rebecca Payne, Emily Keeler and Charles Yao.) They may even apply to life beyond staged events. a) When two people are going to be “in conversation,” in public, they ideally should be about equally familiar to the audience. Or something about the situation might mean that they each attract half a crowd, to whom one is familiar and the other is obscure and vice-versa, and your goal might be to introduce these two publics to one another. c) When that’s not possible or desirable for some reason, don’t play the less-well-known person for a patsy. The simplest thing might be to say upfront that they’re interviewing the better-known person. Bonus points: A very good trick can be to have the better-known person be billed as interviewing the less-known person. This can bestow a glow of generosity to the whole proceeding. d) If that’s not what you want, there is a solution: a moderator, who relieves the speakers of visible responsibility (and blame) for guiding the conversation. A good moderator will help keep the share of time in balance. A really good moderator can also lend shape to a conversation that might otherwise ramble on endless tangents. A great moderator can do all that while seeming invisible. e) If all else fails, you can alleviate a great many sins by bringing the audience into the conversation. At heart why should a question-and-answer period be so much shorter than the period speakers spend deciding the subject matter? The crowd is often much more dynamic. Obviously, again, a moderator needs to keep the Q&A on track, but I’d be as happy to go to a show that was all Q&A and zero meandering speaker as vice-versa. Ultimately, any form of entertainment that solely consists of somebody or somebodies speaking, if they are not just telling jokes, is dicey. It is only so much fun to listen to people talk and not to talk back, unless it’s very lively and engaging. There are a million ways for it to go wrong and the only way for it to go right is for someone to think through, carefully and conscientiously, “Just what is this going to be like?” Otherwise it is dubious that it should be done at all. And this is worth talking about right now because these kinds of staged conversations and lectures and such have retaken a central place in our culture – the decline of print and rise of the digital-virtual somehow combining to generate a keener hunger for physical presence and non-fiction discourse than previously in my lifetime, like a return to the days of the chalk talk and Mark Twain. And, as it was then, it’s becoming one of the few ways writers can make a living. If that’s how it’s going to be, it should itself be a kind of art, not an afterthought. PS: If you’re interested in this general subject, this series of video chats between Misha Glouberman and speakers’ agent David Lavin might be worth watching.